The beautiful month July has gone by and we have some stories and experiences to share with you! This month we have had many people getting their Open Water (OW) or Advanced Open Water (AOW) certifications. It’s always very nice to help new divers develop their diving skills and encourage their love for the ocean. We will like to congratulate Magnus and Gil on their AOW certification and also Jesper and Vasily on their OW certification!! Welcome to the club guys. Also, we would like to do a special shout-out to our customer Omar Mohideen. He has been coming back to Kurumba since he was a kid and he actually started diving doing a Bubblemaker with us when he was 9!! 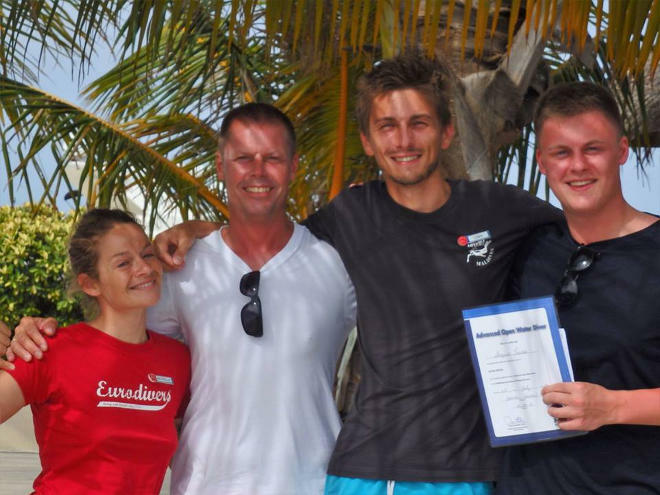 Now he is and Advanced Open Water Nitrox Diver and all his certification were done here in Kurumba. 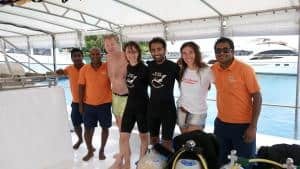 He says that Euro Divers Kurumba is the best place to do certifications and, as a proof of that, he brought his girlfriend these holidays to do his Open Water Course with us. Congratulations Angelica & thank you Omar for keep on choosing us! In Maldives there is a lot of beautiful dive sites, some of the most famous ones are called “Thilas” and in those sites some of the most beautiful corals can be found. This month we did a beautiful dive to HP Reef, which is one of these beautiful Thilas. This place is filled with a lot of soft coral and many fish of all kinds, a true paradise underwater! We are very happy with all the amazing times we had this month, and we cannot wait for the new adventures that the next month will bring.